At the heart of the Guatemalan jungle, famous adventurers are about to explore the ancient Mayan temple of the rain god Chac. According to legend, the temple is full of priceless archaeological treasures and countless deadly traps! Will the Adventurers survive these nefarious traps together, or will they betray each other to claim the artifacts as their own? The Adventurers is an exciting game for the whole family - one unlike any game you've played before! Throughout the adventure, walls close in on your Adventurers,a fast-moving river rushes towards a deadly waterfall, and a massive boulder threatens to shut in the Temple forever! The Adventurer lucky enough to escape with the most artifacts wins! To begin, I love this game. I purchased it initially because it looked gorgeous and you could play with a large group. It didn’t hurt that it came with a bunch of miniatures that needed a good paint job. It took a few weeks, but my wife and I managed to make a pretty colorful and lifelike set of minis to play with. I think this enhanced the game greatly, but that might just be due to my own personal aesthetic (I like D&D minis afterall). The Goal: To escape the Temple with your life and treasure (if you’re lucky), before your fellow adventurers. The Game: You choose your character (or have one chosen at random) and attempt to navigate an Indiana Jones-esque cavern without getting smashed by boulders, squished by walls that close-in, drowned in a pool, or scorched by lava. You do this by choosing your steps carefully. Some actions might bring you closer to the goal in less time, but they come with risks. One of my favorite areas right from the start, is the room with the walls that threaten to squash you with every turn. You can gain valuable clues (to a later puzzle) by sticking around and inspecting the walls, but if you hang around too long, you just might get flattened. There are more puzzles along the way, and a few that can be bypassed by choosing an alternate route (you can avoid the treacherous river only by crossing the rickety bridge). Overall, it is a fun group game — you can outwit your opponents by scooting ahead, setting the bridge to collapse on your friends; hop from rock to rock while they plummet to their doom below; narrowly escape the rolling boulder as it flattens your fellow adventurer. Just don’t forget to collect some treasure along the way — just in case one of your friends manages to escape with you, you’ll want some extra loot to secure your victory! 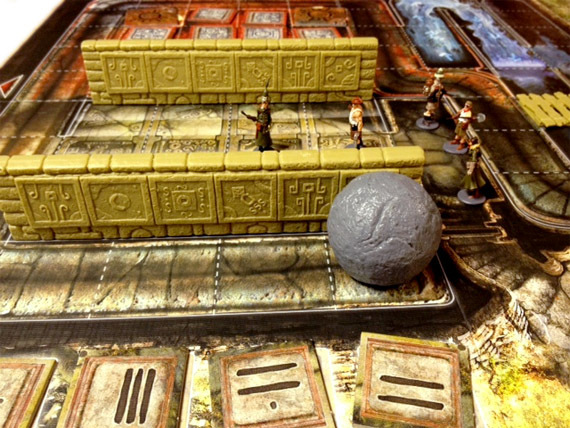 The Adventurers is played out on a square board that depicts the Temple of Chac. The route from the entrance is linear, beginning in the Walls Room and winding its way past the Lava Room and the minor vaults to the Underground River and the rickety Wooden Bridge, past the main vault, before reaching the exit. Each player controls a pair of adventurers who will enter the Temple one at a time and move towards the exit, making decisions based upon the adventurer’s skill and the number of action points he has from turn to turn. There are six skills in the game: Leap, Linguistics, Lock Picking, Sprint, Stamina, and Swimming. Each of these skills is a one shot affair and are divided between those that can be used in specific circumstances and those that have a general application. Leap, Sprint, and Stamina can be used anywhere, while Linguistics can only be used determine if a glyph indicates an unsafe tile in the Lava Room; Lock Picking to open one of the treasure vaults; and Swimming to get out of the river more easily. In general, the specific a skill’s application, the more likely that it will affect a player’s tactics. For example, a character with the Lock Picking skill is more likely to try opening a treasure vault, while a character with the Swimming skill will probably try to swim the Underground River. The Adventurers comes with lots of cards, cardboard tiles aplenty, and numerous bits of plastic. There are Treasure Cards for each of the main locations on the board, including the Walls Room, the Lava Room, the Treasure Vaults, and Underground River. Each of the Treasure Cards has a value ranging from one to six. In general, the more difficult a Treasure is to obtain, the higher its value. Some Treasure Cards depict a casket and a die symbol, meaning that their value must be rolled for at the end of the game. There are also the twelve character cards. These depict each of the adventurers in full colour along with an icon indicating his skill, plus charts for determining his Load Level on the back along with his Action Points. 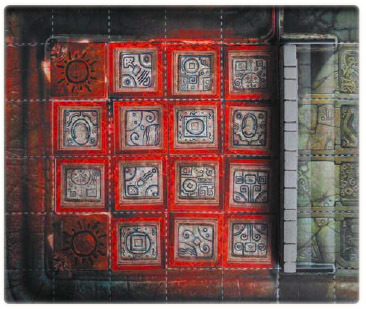 There are two sets of corresponding tiles, the Lava Room Glyph tiles and Glyph Clue tiles. The former are placed Glyph face down on the Lava Room and covered with the Dark Masking Card, a square of black that hides the tiles until someone enters the Lava Room. Four of the Glyph Clue tiles are randomly drawn and placed alongside the Walls Room where they can be examined by an adventurer and committed to memory ready for when he tries to cross the Lava Room. These four Glyph Clue tiles indicate the unsafe tiles in the Lava Room. The plastic starts with the twelve adventurer pieces. 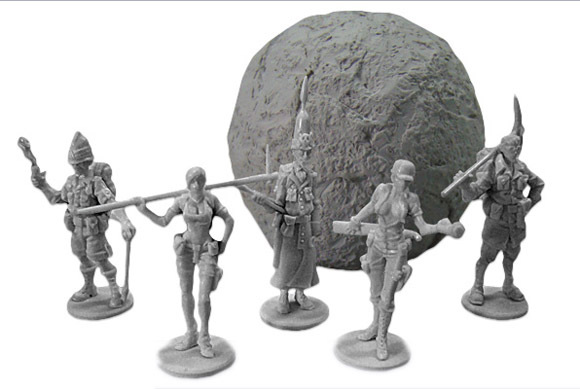 These are sculpted to match the images and are very nicely detailed. Unfortunately, they are all uniformly grey and can be a little difficult to tell apart when placed on the colourful board. The other pieces of plastic include the two walls that will the Walls Room, the Boulder that will chase the adventurers to the exit, and the rickety bridge for the Wooden Bridge. The Boulder is flat bottomed, so it slides rather than rolls, and the Wooden Bridge has several planks that are likely to be knocked loose into the abyss below as a procession of the overly laden adventurers race over it. The mechanics from turn to turn are relatively simple. Starting with the Dicekeeper, a role that will pass around the table, the players take it in turn to roll for the number of Action Points they have to spend on their turn. To do this, each player rolls five six-sided dice, and for each die that rolls above a threshold determined by his adventurer’s Load Level, he gains an Action Point. For example, if an adventurer is carrying up to three Treasures, his Load Level is two and he has to roll two and over on each die. Carry between four and six Treasures, and the Load Level is three and he has to roll three and over on each die. An Action Point can be spent to move – walk, sprint, leap, or swim – one square; to examine any square for treasure, in the Walls Room, Lava Room, and Underground River; to examine a Glyph tile in the Walls and Lava Rooms; to make a single attempt to unlock a Treasure Vault; and to use any adventurer’s Skill. Once everyone has had their turn, the Dicekeeper draws cards to determine the movement of the Walls in the Walls Room and rolls dice to see if the Boulder moves. It moves one square for each result of three or more rolled. On the first turn, only one die is rolled, but this increases by one die each turn as the Boulder games speed until all five are being rolled at the end of the Dicekeeper’s turn. A dead adventurer loses all of his treasure gained so far. If the player still has an adventurer waiting outside, he can enter the Temple of Chac through entrances created by the Boulder passing the Lava Room. As the adventurer is entering further onto into the Temple, there is less opportunity for him to gather treasure and he will need to find his way past the Boulder in front of him. Probably by swimming the Underground River and searching its bed for treasure. If this second adventurer is lost, then his player is out of the game. The winner is of course, the player who gets one or more of his adventurers out of the Temple with the most treasure as determined by the value of the Treasure cards. It is entirely possible for nobody to get out of the Temple of Chac, and thus for everyone to lose. For some, The Adventurers will be too much of a luck based game. True, what a player can do from turn to turn is determined by a roll of the dice, but it is up to the player to decide what he does with the results of the dice roll. One issue is the relative complexity of determining the safe Glyph Tiles in the Lava Room. While perfectly in keeping with the game’s theme, it can detract from an otherwise fast paced game and will probably be too complex for younger players. Also, once a player has lost one adventurer, he will find himself playing catch up with his competitors. That said, a game of The Adventurers can be completed in as little as thirty minutes and the likelihood is that you will get another game in before ninety minutes is up. There is also the matter of cost. Given its plastic components and large number of cards and tiles, The Adventurers is by no means an inexpensive game. It gets even more expensive if the owner decides to add the painted plastic pieces that the publisher also sells. These are very nice though, the full colour adventurers in particular, which make the playing pieces far easier to distinguish than the grey of the set that comes in the game. Nevertheless, the core set feels a little overpriced given the lightness of the game play. 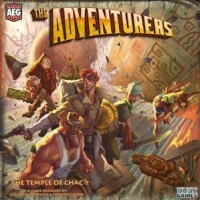 Add a Review for "The Adventurers: The Temple of Chac"